Home » Who We Are » Work With Us! Vantage Point is growing. As a result, we are always looking for talented professionals to make our team even more innovative and capable. 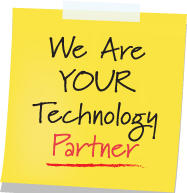 We are looking for individuals who not only know technology but also have a great rapport with clients, colleagues, partners, and prospects. Work Environment – Our work environment is friendly and collaborative. But we’re serious about professional growth. We help every member of our team keep abreast of the latest technologies, trends and techniques. Resources – You need the right tools to perform at your peak. That’s why we make every effort to provide our employees with the education, resources, and equipment they need to provide superlative service. Benefits – We offer a competitive salary, performance bonuses, health insurance, and paid time off. A Culture of Success – When our team members are successful, our company is successful. We want our employees to be successful in everything they pursue. When individuals are ready to advance professionally, we provide opportunities to move into new roles within the company. And we allow staff to concentrate in those areas of technology that interest them. We believe the more success we achieve as a company, the more we will be able to share that success with those around us. Sound like a fit to you? If so, send us your resume and a cover letter stating what you are looking for and why you are the best at what you do. If you have a baseline understanding of IT and are eager to learn, let us know!